Across the total force, Army leaders, soldiers, Army civilians, retired soldiers, veterans, industry leaders and Army families are all excited about this year’s Association of the United States Army Annual Meeting and Exposition. One of the highlights of this year’s Annual Meeting is the opportunity to recognize and celebrate the selection of a great noncommissioned officer as our 2018 Sergeant Major of the Army William G. Bainbridge Medal recipient. Command Sgt. Maj. Robert W. Van Pelt, USA, Ret., served in the United States Army from 1969 to 2011. Throughout his 42 years of service, he served in numerous assignments in the Army National Guard, Regular Army and Army Reserve. Command Sgt. Maj. Van Pelt began his Army career as a draftee in March 1969 where he served as a Fixed Station Automatic Digital Network Technical Controller assigned to the First Signal Brigade in Phu Lam, Republic of Vietnam. Following Vietnam, he was assigned to the United States Army Strategic Communications Command at Camp Darby, Coltano, Italy. Command Sgt. Maj. Van Pelt then left active duty and joined the New York Army National Guard where he served with the 187th Signal Group. Later in his career, job opportunities took him to Tennessee where he continued his Army career serving as the communications chief for Company A, 3/109 Armor, with the Tennessee Army National Guard. While living in Tennessee, he was given the opportunity to serve as a construction chief with the 416th Facility Engineers, Fort Campbell Survey Team, U. S. Army Reserve. Returning to his home state, Command Sgt. Maj. Van Pelt rejoined the New York Army National Guard. While serving with the New York Guard, Command Sgt. Maj. Van Pelt rose through the ranks to sergeant major in March 1987 where he served as the operations sergeant major for the 187th Signal Brigade. Command Sgt. Maj. Van Pelt is a 1991 graduate from the United States Army Sergeants Major Academy Class 37. Appointed to command sergeant major in October 1991, he served as the command sergeant major for the 242nd Signal Battalion, 1-101st Cavalry, 187th Signal Brigade, 53rd Troop Command, and managed the Empire State Military Academy Signal School in Farmingdale, Long Island. Throughout all these assignments, Command Sgt. Maj. Van Pelt’s leadership and duty performance resulted in his selection as the division command sergeant major for the historic 42nd Infantry (Rainbow) Division in 1998. Command Sgt. Maj. Van Pelt’s Army career culminated in June 2001 with his appointment as the command sergeant major for the New York National Guard, a position he held until his retirement in June 2011. Wanting to continue to serve soldiers in another capacity after the Army, Command Sgt. Maj. Van Pelt accepted a position as the New York National Guard Employer Support of the National Guard and Reserve program manager. His work, fostering relationships between local employers and the reserve components, led to an opportunity to serve as a New York National Guard Transition assistant advisor, aiding New York guardsmen in their transition from Army service. Command Sgt. Maj. Van Pelt is a longtime volunteer serving the Capital District of New York Chapter of the Association of the United States Army. He started his leadership role with the chapter serving as the chapter treasurer for four years and then serving as the chapter president for six years. Today, Command Sgt. Maj. Van Pelt continues to support his AUSA chapter serving as the first vice president for membership. Additionally, he is now in his fifth year serving as a member on the AUSA Retiree and Veterans Affairs Committee. Command Sgt. Maj. Van Pelt’s selfless service also extends into the local communities where he serves as the chairman of the grants committee on the National Guard & Naval Militia Relief Society of New York, Inc. He is also a member of the Veterans Outreach Committee serving on the Saratoga County Chamber of Commerce Veterans Business Council. Command Sgt. Maj. Van Pelt is a passionate volunteer who has given thousands of hours of his personal time and resources to support his chapter and community activities. A lifetime of selfless service, serving our nation, our Army and our association, these meaningful contributions reflect a life-long service to our soldiers, Army civilians and all their families. Command Sgt. Maj. Van Pelt epitomizes the intent of the “Soldier for Life” program with his continued service to our nation out of uniform, and his unwavering support of our soldiers and their families. A “Soldier for Life,” Command Sgt. 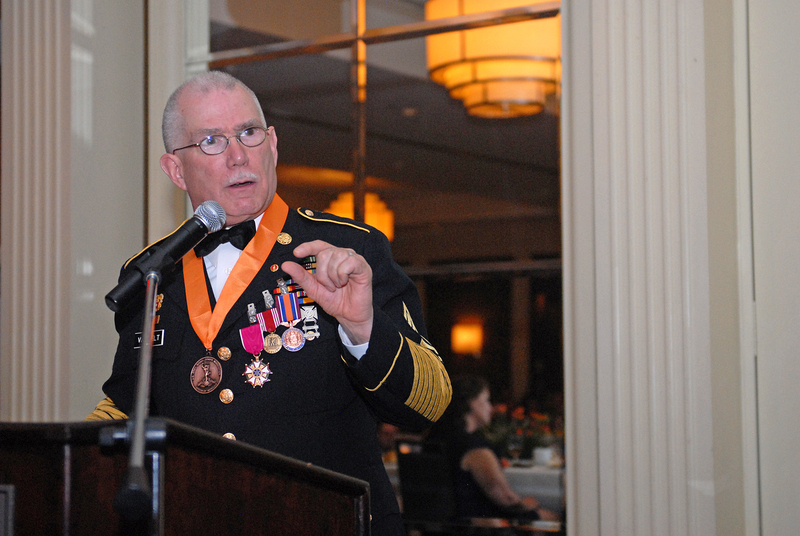 Maj. Robert W. Van Pelt’s support of the goals of the Association of the United States Army and the Noncommissioned Officers Corps are in keeping with the highest traditions of our Army and make him the deserving recipient of the 2018 Sergeant Major of the Army William G. Bainbridge Medal. AUSA membership is the volume knob to ensure your voice is amplified many times over and heard throughout the halls of Congress, from sea to shining sea across this country, and throughout every small town and community in-between.